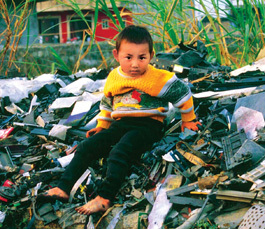 Your junk stops here: A child in Gulyu, China sits atop one of countless piles of unrecyclable computer waste imported from around the world. 'State authorized recyclers' and 'free electronic recycling' are soothing Silicon Valley's conscience about E-waste. But the dirty truth behind the feel-good slogans is that our high-tech industry is piling up millions of tons of hazardous waste around the globe. AL GORE'S February visit to Silicon Valley and local industry's embrace of solar technologies, environmental philanthropy and the global warming debate have helped burnish high technology's reputation as an eco-friendly industry. The real inconvenient truth, however, is electronics waste—and the mountains of toxic trash that industry foists on developing nations. High-tech companies do more than just sweep E-waste under the rug; they're sending it across the world in violation of international laws enacted to protect poor nations from the excesses of the world's wealthiest. Americans love their E-stuff, but most of them never see what Ted Smith, the founder of the Silicon Valley Toxics Coalition (SVTC) and coordinator of the International Campaign for Responsible Technology, calls the "collateral damage" of the high-technological revolution. He recently co-edited Challenging the Chip, a handbook by 25 activists wrestling with the problem everywhere Silicon Valley companies have offshored their toxic footprint. With a business model that's based on selling the latest technology, most high-tech products are obsolete within two years. Smith says when we rush out to buy the latest thing we're unaware that prices are lower because the Third World women who make them are paid peanuts and they work in factories as dangerous as 19th-century textile mills. Most of us are likewise clueless that these products contain hazardous and nonrecyclable materials. Even when we think we're recycling them, we're generating Mt. Everest-size piles of toxic waste that are exported overseas. Last year, a billion cell phones were sold. Latest figures say at least 130 million computers are sold a year, half of them in the United States. Rick Hind of Greenpeace's Toxics Campaign says because less than 10 percent are recycled, junked computers, cell phones, copiers, monitors, ipods and everything else that plugs us into the information age are piling up at the rate of up to 50 million tons a year. So where's all this E-waste going? Smith says most of the cell phones recycled here will go to Latin America, Africa and Asia. "When you return them to your service provider, they export and sell them for about $30 bucks," says Smith. "They make a second profit, and when the phones die they become E-waste over there." Hind says most high-tech trash ends up in China, Latin America, Africa, India and anywhere else you can find cheap labor without worker safety, child labor or environmental protection laws. "You're dealing with materials that you can't properly recycle," says Hind. Even if you recycle what's usable, the majority of it winds up in landfill or in an incinerator releasing toxins. Most local recyclers are E-waste collectors. California pays them to recycle computer monitors, TVs and laptops using the $6 to $10 Advance Recycling Fee that's collected by retailers on sales. They sell the rest to brokers, who ship it to global junk heaps where the world's poor earn a couple of dollars a day breaking E-stuff apart by hand to recapture whatever can be sold. Under the terms of the Basel Convention, enacted in 1994, E-waste was designated as hazardous waste because its ingredients are toxic. "Like the Kyoto Protocol," says Smith, "the U.S. is the only major country that's refused to sign it. It prohibits shipping hazardous waste from rich countries to poor countries." To get around the problem, the United States classifies E-waste as "special wastes," creating a loophole when exporters say they are using an overseas recycling facility or when they call it spare parts. That's how it gets into China, which doesn't officially accept E-waste. "Unless you've been in some of these 80,000-square-foot warehouses that are oceans of monitors, CPUs, keyboards, cables, printers and fax machines, it's kind of hard to imagine how large this problem is," says Sarah Westervelt, a Toxics Research Analyst with Seattle's Basel Action Network. BAN's film Exporting Harm: The High-Tech Trashing of Asia documented this cyber nightmare back in 2002, but little has been done about it. She says most recyclers turn around and sell high-tech waste to brokers, who sell it to the highest bidder—which is usually, China since it needs aluminum, copper, steel and plastics to manufacture the world's gadgets. "We were horrified to find they only extract the few things they need and then throw away the rest," Says Westervelt. In China, workers break computer monitors apart to reclaim copper bands. Each monitor contains 4 to 8 pounds of nerve-damaging lead. What can't be reused is thrown in heaps that choke village roadsides and leach into ground water. They also sweep out small amounts of toner to reclaim it from empty cartridges. Toner contains carbon black, which is a carcinogen. Empty cartridges are added to the heaps along with other plastic waste. When piles get too large, they're burned. Families set up makeshift villages along riverbanks where they subsist sorting and burning cables and wire to liberate recyclable metal like aluminum, steel and copper from its surrounding plastic. Other workers extract metals from circuit boards by either heating them on coal-fired grills or bathing them in acid, which they then dump into their rivers. Westervelt says adults make less than $2 a day, and children earn much less hammering metal out of components or sorting wire and plastic. Few wear safety glasses, gloves or masks. Poisonous compounds infiltrate their air, water, soil and food. These poisons cause birth defects, infant mortality, cancer and respiratory problems because electronic products are made with toxic ingredients like PVC, mercury, lead and cadmium. E-stuff's plastic contains brominated flame retardants. Heating it creates dioxins and furans which are some of the most toxic substances known to humankind. They're invisible and have no smell or taste. "It's very easy for workers to be exposed to them and not know it," Westervelt says. "China, Africa and other places that get our E-waste have rising cancer rates and very toxic air and water quality." Westervelt says her group took water samples in China in 2002 that revealed lead levels 2,400 times higher than the World Health Organization's limits for drinking water. "There's just tremendous exposure occurring and going into their rivers, which of course are dumping into the oceans," she says. In 2005, she went to Lagos, Nigeria, where exporters had started selling container-loads of First World discards sight unseen." They labeled it as going for reuse saying 'We'll help bridge the digital divide,'" says Westervelt. "What we found was 75 percent of it was complete junk even there, because it was so obsolete nobody wanted to buy it or because it wasn't repairable. So they put these mountains and mountains of E-waste into dumps and landfills and just set them on fire every time the mountains got too high." Most open-air E-waste burns, she says, are located around housing and children worldwide. E-waste is already called the fastest-growing landfill waste stream. Every new generation of technology, such as Microsoft's recent Vista operating system and the 2009 conversion to digital TV, sends zillions more of our computers and TVs to global trash heaps. Given there's no national law regulating E-waste, California, Maine, Maryland and Washington state offer to pay collectors or have producers pay to recycle a very short list of products. With the state paying to recycle what's covered, and the ability to sell the rest to brokers who export it, E-waste collection has become a growth industry in California. Westervelt calls it "E-waste anarchy." Consumers are confused because participating collectors can call themselves "state authorized recyclers" and advertise "free electronic recycling" when they only recycle the few items California covers and then sell the rest to brokers who usually export it. There are dozens of electronics recyclers listed in Silicon Valley's AT&T Yellow Pages. California's Integrated Waste Management Board, which administers this program, lists 49 valley collectors and recyclers of Covered Electronic Waste. Yet only three, ECS Refining, GreenCitizen and Zak Enterprises, have taken the Basal Action Network's "Electronics Recycler's Pledge of True Stewardship." This means they're recycling responsibly and safely disposing of the toxic ingredients. "It's important to look closely at what recyclers are charging to take what California doesn't cover," says Westervelt. "If they take it for free, that's a red flag. If it's not a Pentium 4, it probably has very little value in the reuse market so it's very likely going to be sold to a broker and shipped to an overseas dumping ground." GreenCitizen will be celebrating its second anniversary this Earth Day. Its founder James Kao says they've served over 25,000 people, and 60 percent of their transactions involve money. "People are willing to pay to recycle when they understand E-waste's consequences," he says. "We aren't trying for a quick buck. It takes time and money to process electronics properly and to do the right thing." Smith says manufacturing E-stuff involves a witch's brew of chemicals. Many are known or suspected carcinogens or reproductive toxins that contaminate groundwater and air. The workers who make these products and residents near production facilities suffer from high rates of cancer, tumors, miscarriages, birth defects and other diseases. Smith says this toxic footprint follows Silicon Valley companies wherever they go. "This is a nonunion industry all around the world. So when workers try to organize to protect themselves they're usually fired," he says. SVTC and Smith's new group, the International Campaign for Responsible Technology, have helped people in Scotland, Mexico, Taiwan and China make electronics companies accountable for the damage they've caused. SVTC, along with BAN, Greenpeace, the Computer TakeBack Campaign coalition and many other environmental groups, is proposing front-end solutions. It has asked corporations to take back their products and recycle them responsibly, eliminate their products' toxic ingredients and design them for recyclability and reuse. "It's a lot cheaper to prevent pollution in the first place," says Smith. "The way you prevent it is to make producers responsible for the whole life cycle of their products. Then they'll redesign the product so they get rid of the nasty stuff." In 1989, SVTC discovered that IBM's San Jose facility was the single largest discharger of ozone level-destroying chlorofluorocarbons in the United States. "We had a big demonstration saying 'Get rid of this stuff, it's dangerous,'" says Smith. "They said, 'We don't know how, it's too complicated and too expensive.' Six months later they replaced it with soap and water. That was the big 'ah hah' for us. If you push these guys hard enough they'll put their brilliant engineers on at the design end and solve these problems. If they don't have to pay those costs, and they can externalize them on society, what do they care?" The problem, according to Smith, is that there's no national law requiring companies to take back and recycle their computers. "There's no U.S. law requiring the phase-out of the most toxic materials, and there are no national laws prohibiting the export of hazardous E-waste to poor countries," he says. Hidden from sight is what the rest of the developed world is doing. European Union directives require electronics manufacturers to take back their products free, and they have target dates for the elimination of products' most hazardous ingredients like lead, cadmium, mercury and certain brominated flame retardants. The directives cover lots of products from cell phones and computers to refrigerators and E-toys. Margaret Bruce, director of environmental programs for the Silicon Valley Leadership Group, says the E.U. has triggered a broader change because companies can't produce two versions of their products, as in "Hold the toxins, these are going to the E.U.!" Companies like HP and Dell are ahead of the curve, phasing out their products' most toxic chemicals and heavy metals, while other companies get failing grades on SVTC's Computer Report Card. In January, Smith, Greenpeace's Rick Hind and other environmental leaders went to Washington, D.C., and met with a mix of House and Senate leaders. They're hoping the new Congress will legislate E-waste, and what they heard was promising. Like brominated flame retardants, Napa's U.S. Rep. Mike Thompson is a guy who can take heat and wants a national E-waste program. Republicans call him "Baghdad Mike" for wanting the United States out of Iraq, and he has called for an Airline Passengers Bill Of Rights law. Moved by pictures of children on global trash heaps, he started a bipartisan Congressional E-waste working group. Last September, they met with dozens of stakeholders, including big-name computer manufacturers, retailers' and recyclers' trade associations and SVTC. He asked them to come back this month with their recommendations for a national E-waste recycling program and a way to fund it. "My plan is to look at their recommendations and come out with a bill that we can get passed into law," says Thompson. "We need one national standard. Not having one gives us 50 states with 50 different ways of dealing with E-waste." He also took a look at the legislative branch's monumental levels of E-waste and asked the GAO to come up with a best practices model to implement as soon as possible. "I think we should be leading by example on this," he says. One success story in the search for an E-waste solution is the Computer TakeBack Campaign. Given the United States' dismal recycling effort and no national laws controlling or prohibiting toxic ingredients, a coalition of environmentalists, unions and socially responsible investors began lobbying computer companies, asking them to offer free take-back of their products. They figured if companies took them back they'd make them less toxic and more recyclable, which means less hazardous to workers and the environment. They started with Dell, figuring if they got on board others would follow. They held town hall meetings, brought E-waste to CEO Michael Dell at shareholder meetings, sent him thousands of letters and held an E-waste fashion show outside of Mrs. Dell's dress shop. Dell is now a take-back leader. Computer manufacturers are required to take-back in Japan, South Korea and Taiwan, yet many oppose doing it here. Thanks to CTBC, take-back legislation is currently being considered in a dozen states. CTBC member Greenpeace is putting pressure on Apple Computer to go greener with a mock Apple website. Greenpeace thinks Apple should take the same leadership role it takes with design and technological innovation. They demonstrate outside of MacWorld because MacWorld won't sell them exhibition space. Apple spokeswoman Kristin Huguet says Apple has "a strong environmental track record" and that they "lead the industry in restricting and banning toxic substances." But lead the industry they don't. They comply with the E.U. 's RoHS Standards ("the restriction of the use of certain hazardous substances in electrical and electronic equipment"), along with everyone else who wants to sell products there. "Their website does a great job of green-washing but unlike Dell and HP they won't commit to a firm date for eliminating PVCs and BFRs from their products," says Hind. "They have Al Gore on their board, but where's their environmental conscience? This is another inconvenient truth, they make disposable unrecyclable products, and the people getting hurt by it are the poor and very young in the developing world. We want producer take-back so every maker has the same responsibility. And that's what every company should want, a level playing field." So what can the high-tech consumer do about the E-waste problem? "If you're going to be a consumer, be a good one," Smith says. "Be one that actually uses your buying power to make the world a better place. It's not insignificant what we do with our cell phones. It's not insignificant what any one person does, because when you put together millions and millions of consumers it makes a huge difference. We're the most privileged people in the history of the world. There's no question about that. The fact that most people don't know about these problems doesn't speak very well of us, but it's even worse if you know about it and don't do anything." www.computertakeback.com: Find responsible sellers and their takebacks. www.svtc.org: Silicon Valley Toxics Coalition—get involved—read their Buying Guide and Computer Report Card. www.ban.org: Basal Action Network—find responsible recyclers.